Ever wanted to try something new and exciting? Since my American neighbors will be celebrating Thanksgiving next week and I’ve much to be thankful for–I thought it the perfect opportunity or should I say–shoppertunity to come up with a Thanksgiving-inspired cupcake recipe that will tantalize your taste buds! I decided to make the recipe ALMOST organic and add in an explosive (not literally but, it’s delish) ingredient that you may not expect and replace the milk in my recipe. This lowers the calories, makes it light and moist and adds a punch of flavor that will send you over the edge. 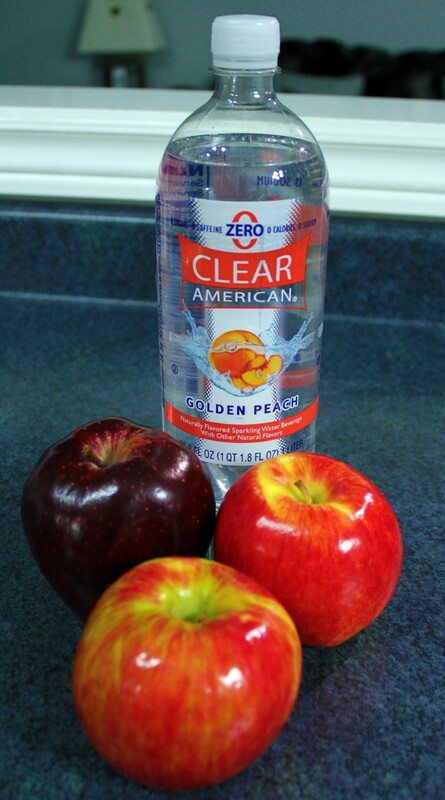 If you haven’t guessed yet, it’s Clear American Water and in this case, it’s Golden Peach! 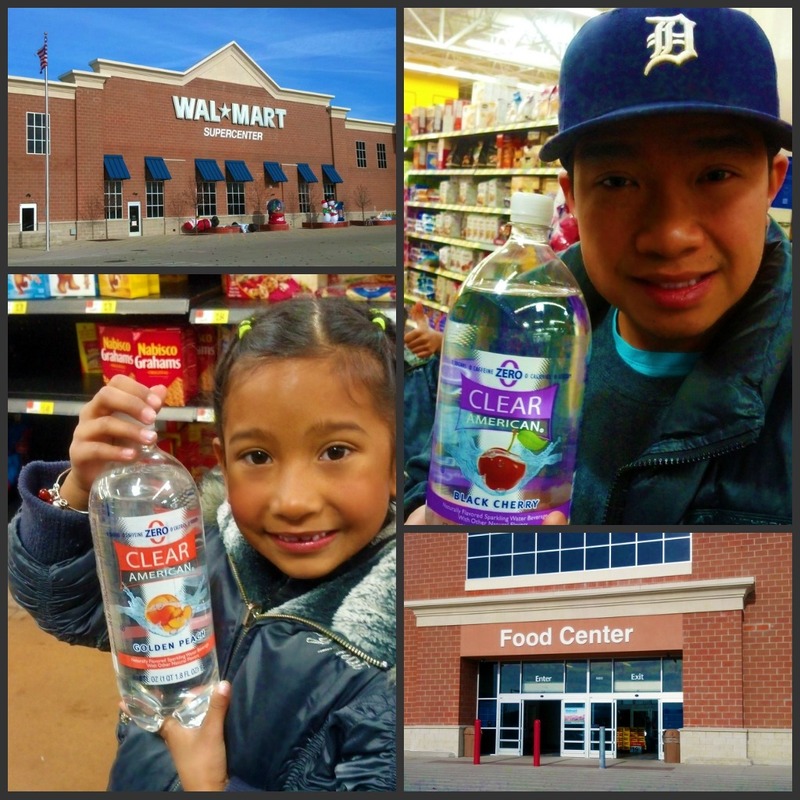 I headed over to Walmart in Michigan to do some shopping with my family, I was looking for some alternatives to make a cupcake recipe lighter and less calorie dense and I had the opportunity to scope out Clear American Water for #CBias. It was so easy to find too and stood out from the rest because of its size and vibrant colors. Now, for 68 cents you can’t go wrong, especially since I was planning to substitute it for the milk in my recipe. The bottle is fairly large and you really do get bang for your buck. For my frugal peeps, this is a great buy. If you aren’t sure what Clear American Water is, it’s carbonated flavored water that has 0 calories, Caffeine Free and Sugar-Free. It’s also Kosher and Sodium free and “Naturally” flavored. We don’t often buy flavored water in our household but, I rather buy it than give Gabs pop (or soda like my American friends say) on a regular basis. Milk and water are a staple in their diets so, in our house, Clear American is a nice, occasional and refreshing treat! Hubby bought a Black Cherry and my eldest bought an extra Golden Peach and my youngest, Mimi, skipped it! My Apple Caramel-Peach Explosion Cupcakes! Add the melted butter and cream cheese into a mixing bowl. With a blender begin to blend and slowly add the powdered sugar, blend until it is creamy and to the texture that you prefer. Make sure you use it immediately, if not–wrap it up and place it in the fridge. For the Caramel Drizzle, microwave the candies and margarine for about 1 minute on medium heat. Stir until smooth and place aside, if it hardens place in the oven for another 30 seconds. Wash and peel about 2 of your favorite type of apples. Once peeled, cut them into quarters and then cut those quarters in half. I chose organic Gala Apples because I love how crispy and juicy they are. Some prefer to use a more tart apple in their recipes but, I like naturally sweet so I opt for this variety. Get a measuring cup and measure about 1/2 cup of Clear American Water in Golden Peach. Add it to a cooking pot and add 2 TBSP of organic butter or margarine. Add the 1 TBSP of cinnamon and stir until it is melted. Once it is simmering, add the apple slices and switch your oven to low heat, cover and let simmer until apples are soft. Add a TSP of organic brown sugar and stir into the Clear American-Golden Peach infused apple mix, shut off heat and cover. Once cooled, drain apples and collect the Golden Peach-infused mix into a measuring cup. Do NOT throw it out. Set apples aside to cool. Once you’ve collected the Clear American Golden-Peach infused mix from the pot, add more Clear American water to make about 1/2 cup of mix, if needed. This is replacing the milk in the recipe and cutting calories too! If you haven’t already, mix the dry ingredients in a mixing bowl. The flour, baking powder, cinnamon and brown sugar. This is where you add the 3 egg whites and the Clear American Peach-infused mix and vanilla extract, blend until creamy. Go back to the cooked apples you have set aside and dice them to your preferred size. Pick out your most Thanksgiving inspired baking cups and get ready to POUR! 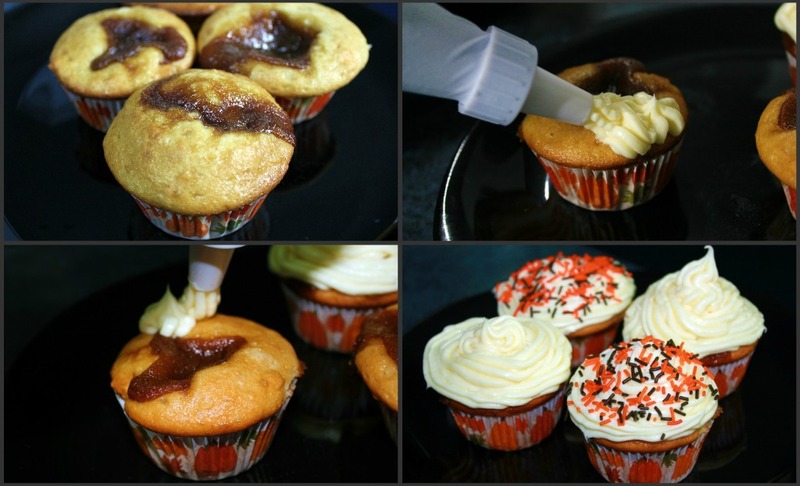 Once you’ve evenly poured the batter into the baking cups, go back to the caramel you have set aside and spoon the caramel on top of the cupcakes. Place the baking tray in the center of the middle tray in your oven for about 15 minutes. The time may vary depending on your oven, so until golden brown. Test if they are ready by poking them with a toothpick. If it comes out clean, they are ready! Top with your cream cheese frosting and decorate them with your favorite treats. I chose fall colored sprinkles for a very simple decor. I also left some cupcakes without frosting for a less sweet option. So, how’s that for daring? Now, what’s Thanksgiving without a bit of sharing? My folks are having a small get together at their house tomorrow and they will be having these very cupcakes for their after dinner coffee and dessert. My kids loved the light flavor and my Hubby said that these are the best he’s tried so far. He much prefers the fruity cupcakes while I love my chocolate. You can substitute your eggs and milk with Clear American water in almost ANY baking recipe and they have so many flavors to choose from. From Key Lime, Black Cherry, Raspberry, and even Pineapple Coconut. The possibilities are endless and if you are already having a treat, why not make it a bit lighter? How do you make your recipes light? Previous Post: « High Liner is Connecting You! What an absolutely awesome post! Not only is the recipe creative (and festive) but you also managed to lighten it up! The photos are beautiful and steps extremely well presented. Thank you so much for this recipe! Looking forward to hearing how all the guests at the party liked them! Why thank-you, it was a pleasure. I love shopping and I LOVE baking. And I am still at the get-together and they are ALL gone! So, they were definitely a hit. I've never met a cupcake recipe I didn't want to try…thanks for the inspiration! No problem, I never met a cupcake I didn't want to EAT. Haha. Self-control. But, I definitely had these. Cream cheese frosting was great! 🙂 Let me know if you do try it, I'd like to see your version! Huh, I never would have guessed you could swap out thick ingredients like eggs and milk with a clear liquid! Interesting idea! oh wow!! That looks so good! I may just have to try this one out! I drink Clear American all the time. I would love to print this recipe out and try it, but could not find a way to print it. Please tell me how. Thanks. I sure am happy to have found these,next free day i’m going to try them ! You’ll love them! So yummy!